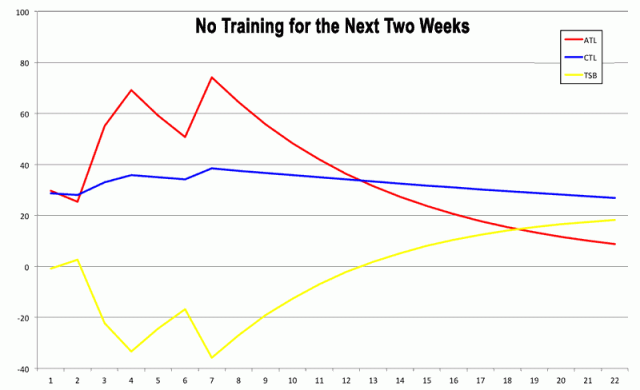 The last few months of training are best described as unstructured. 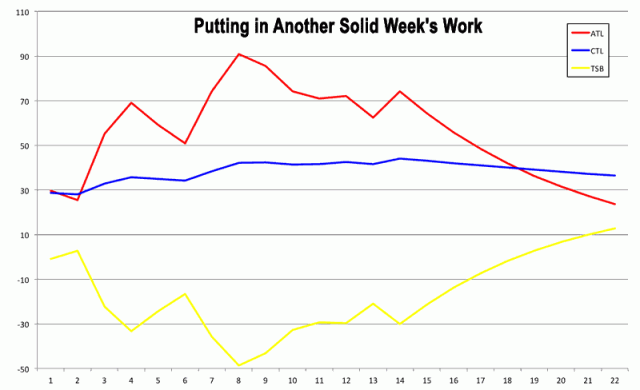 Planning became an exercise in futility as I lacked the motivation to stick to a schedule. This seems to be changing: my former drive has returned and I’m keen to address declining fitness. I can’t say why; it’s just happened. Body and mind are ready to train. Structured training presents some challenges. Balancing life and training is easy when you’re only prioritising one. Now I need to get the mix right: train enough to progress fitness, but allow enough time for work. As a fulltime athlete I could cobble a schedule together from basic sessions and rely on racking up the training stress. Train as much and as appropriately as possible, recover, repeat. Updating my training logs on Sunday I considered the week ahead and how to continue the work I’d started. This is micro-management of training. Taking the sessions I need and finding how they’ll fit. Schedule both in terms of recovery and free time. 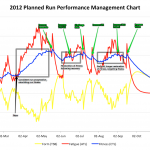 I used the Performance Management Chart (PMC) to guide me; testing out the impact on fitness and fatigue. A blank canvas. Day seven and after a good week my bike fitness (CTL) has picked up. Unsurprisingly if I do nothing for a fortnight all the gains I’ve made are lost. Sit on the couch, catch up on TV and by day twenty-one I’m back where I started. But I’m motivated. I’ve no desire to sit on the couch and there’s nothing I want to watch. Run training is still limited and I’ve yet to track swimming in the PMC so I focussed on cycling. 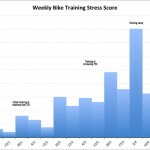 A total Training Stress Score (TSS) over 550 led to big gains last week. It’ll take more of the same to maintain the momentum. But I’ve a busy week ahead with plenty of athletes waiting for their own plans. I can’t ride long everyday. There are windows of opportunity: an easy club ride next Sunday and a long ride this morning. These in place (with estimated TSS) I can shape the rest of the week. 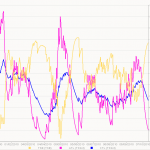 Long rides produce high TSS and easily boost CTL, but not enough for my weekly goal. I can’t afford more road time and anyway the forecast isn’t appealing. Much of this week’s riding needs to be short and sweet. Turbo time. I’m not a fan of indoor training preferring to get it over with. That means more intensity. Friday is a good opportunity to work on threshold: it fits in the schedule and my legs should be recovered to ride well. I’ve room for a couple more indoor sessions early in the day to take me to my goal TSS. A plan was formed: two long rides then a few work-friendly turbo sessions. More intensity on the turbo and keep it steady for the long rides. I’m not yet fit enough to ride as hard as I was at the end of last season. I set my expectations on effort levels with that in mind. The priority is getting back into a routine and used to the volume of training. I went to bed on Sunday satisfied I had a good week ahead of me. This morning I felt fine. Tired from my first solid week of training, but generally well. Wet weather dampened my spirits, but with a friend waiting I hit the road. Rain proved a minor issue. My legs would not get going, they simply didn’t want to obey. Brief stints of reasonable riding would lapse into a casual, conversational cruise. We decided if we we’re going to have a chat it might as well be accompanied by coffee and cake. The long ride was over. 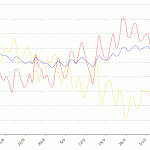 Frustration over my low morale and lacklustre session was abated when I plotted the charts for this blog. This morning’s Training Stress Balance (TSB) sat at -36. I’ve been a lot lower, but as I noted back in January below -30 is entering the territory of heavy fatigue. Especially considering my lower levels of fitness and the absence of run TSS from this figure. I feel tired because I am tired. It doesn’t take much for me to dig deep into TSB when all it takes is an hours steady riding to raise CTL. Training fatigues me quickly because it’s stressing my relatively unfit body. As fitness builds the impact will lessen. I’d have survived a few more hours on the road, but was never looking at a successful training session. It was too much. In light of this I tweaked the plans. The initial urge was to chase after lost TSS. Catch-up and raise that CTL faster. Numbers looked good in Excel, but considering my inability to do quality work and the fatigue I felt was it wise? Doing more later in the week means holding TSB down or lowering it further. I’d be continuing to push the line for a marginal benefit in fitness. Doing less would still raise CTL, allow some recovery and should hopefully mean better quality training. The upward trend is more important than the actual number. Schedule done. A plan that raises my fitness over the next seven days, controls fatigue (I’ll still get tired) and allows time for work. I’ll be able to fit my training in and deliver all the schedules my athletes are expecting. Perfect. The PMC is a useful sanity check when planning training. 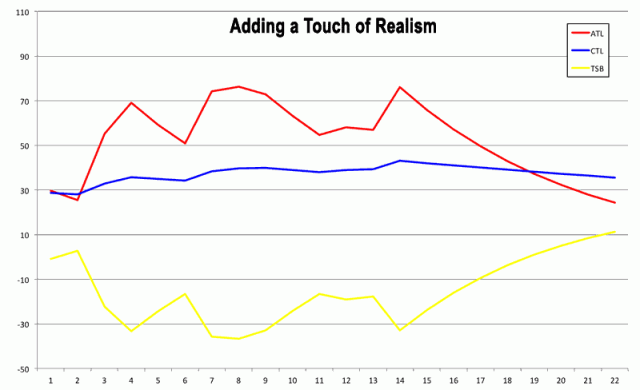 It doesn’t dictate sessions or targets, but it gives hints to the realism in a schedule. Obsessing over raising CTL I lost sight of the importance of TSB. A high CTL is desirable, but in the process of building it fatigue and recovery have to be managed. How often do I preach this? Yet today I experienced the affect myself. The indicators were present in my PMC if I’d taken the time to look, but would I have changed anything? Probably not. I’ve performed well at lower TSB on the right day. The PMC is a guide. A low TSB has implications for performance and recovery, but I can’t say for certain what they’ll be. I use it to enhance the odds of training and racing well. Ultimately I still have to do the work.